Assuming relatively homogeneous cultures and a strong correlation of language and genetically differentiated population groups, there are two big possible candidates for pre IE languages in the Caucasus-Aegean area, aside from substrata derived from indigenous foragers. 1. 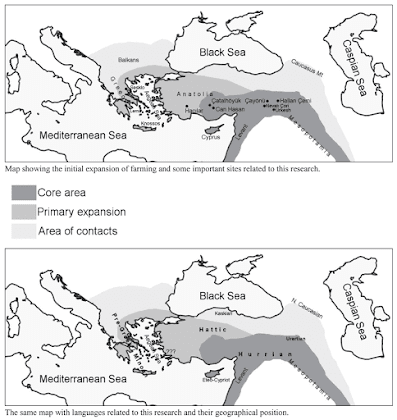 Anatolian farmers who migrated in the Neolithic. 2. Iran Chalcolithic related people who who started migrating from the Caucasus/Levant from the late Neolithic to the Bronze age. I would expect the real possibility of linguistic influence from both of these groups of people into early Greek. Kaskian or Proto-Kaskian mixed with some unknown WHG language maybe ? I'm not sure what to say except that this paper is f###ing awesome. does their "core area" and "primary expansion" take into account the finding of two source farmer start points? i'd think that would complicate their model as instead of one farmer language family being displaced by two pastoralist language families (I-E in the north and Semitic in the south) there might be two extinct farmer language families replaced with two pastoralist ones. Very interesting. Possible multiple subtrata in pre-Greek, odd resemblances to the subtratum in proto-Germanic as well as the East (Hattic, etc). The sequence of events would need fine-tuning with future data. 'Methodologically sound and pleasantly sensible' describes it well! It's also a nice illustration that a good, interesting paper does not necessarily need to be in faultless English. A paper needs to be strong on context and inner logic; the rest is window-dressing. It's nice to see work of people who have their priorities right. It's also nice to get a paper on something the posters on this blog have already been speculating about for some time. And yes, an Iran Chalcolithic migration making it to Greece might well be a spanner in the works (even if the pre-Greek was picked up further north). Still it seems possible now that a reconstruction (partial, of course, so we can read Linear-A) of a non-Indoeuropean proto-Anatolian might go some way. 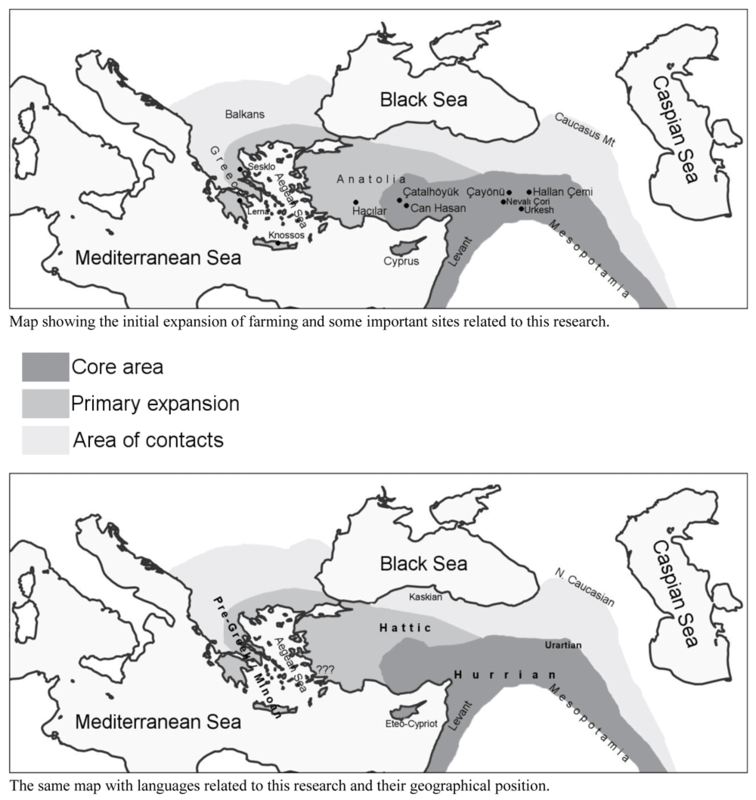 And yes, an Iran Chalcolithic migration making it to Greece might well be a spanner in the works. Not really, because that would explain the genetic structure of Minoans plus the posited linguistic links between Minoan and Hattic, Hurrian, North Caucasian, etc. There are probably unrelated streams of pre-Greek, some that came during the Early Neolithic from western/central Anatolia, and others that came during the Bronze Age from further east. I have been pushing this hypothesis for years. It is nice to see a credible academic paper advancing the same theory with insights I didn't have available to me to fill in some of the blanks. Any model that doesn't differentiate early neolithic languages of Near East from post neolithic ones will be a failure imho. I like the idea of linking Minoan to Hattic, Hurrian, Urartian, and North Caucasian, and to each other. On the other hand, the idea that these languages are part of the same language family as the languages spoken by Neolithic farmers of the Aegean doesn't seem so hot to me, but obviously this is preliminary work. Will be very interesting to get more aDNA from Hurro-Urartian ,Sumerian etc sites . Btw I am now inclined to agree with the idea that Etruscan is the language of G2 rich EEF farmers. ""I like the idea of linking Minoan to Hattic, Hurrian, Urartian, and North Caucasian, and to each other."" I would add Kassites to this list also. @Davidsky Languages associated with the neolithic farmers could have been widespread in the ancient Mediterranean before they got replaced by the Semitic expansion. Do you suppose that the Harappan and BMAC substrate could also have been offshoots of this language family? Do you suppose that the Harappan and BMAC substrate could also have been offshoots of this language family? I don't know. Might have more of an idea after I see the Harappan genomes. The 300 odd non-IE words of early Rigveda were broadly categorised as coming from the BMAC language and the supposedly prefixing Kubha-Vipas substrate by M. Witzel and perhaps also others, but they did not connect the meagre data from these inferred languages with Hurro-Urartian, Kartvelian, etc. as far as I am aware of, am I right? Either they did not pursue that line of enquiry or they did, in which case these languages may not have been related and the Indus language may have belonged to the very early Northeastern Iran Neolithic with northwestern Indian ASI language substrata or to a northwest Indian ANI population and there is a similar possibility, though less likely like the ANI possibility, that the Indus language could have been a genuine ASI language in which case it wouldn't be related much to any of these Near Eastern languages (and the ANIs too I would suppose). Then there is the enigma of Language X, that is if it is the ASI language of the Gangetic plains or just another Indus language. I really hope more comes to be known about the languages of all these pioneers who likely were the source of the zebus of the supposed Dravidian-speakers of the Southern Neolithic, leaving aside for a moment the vexed question of wherever these Dravidian-speaking rascals (but Dravidian somehow appears to be a non-ASI-like language to my gut, even as a person who is very inclined to Dorian Fuller's hypothesis that the mesolithics of parts of western India at around 3500 BC seen making coarse pottery and beginning to tend to the zebus at Loteshwar are Pre-Proto-Dravidian speakers, I hope the question about the existence of pre-Iran-Neolithic ANI in India also begins to be answered sooner) came from ultimately. Another enigma for me about these Dravidian speakers is the presence of L haplogroup lineages and yet appearing to not have any important role language wise in the IVC proper. Perhaps they joined Dravidian-speakers after IVC collapse who accorded them the high status that we now see manifesting in the higher caste status of their descendants or it may date to the initial Proto-Dravidian ethnogenesis period itself, with some of these L males of the IV Neolithic deciding to join these primitive PPD herders for whatever bizarre reason or some other wild things like that? Other less wild and more likely possibilities exist of course, such as that these Ls may have come from the Deccan chalcolithic cultures of Maharashtra regions with whom the Southern Neolithic maintained good trade relations. Also, assuming L was a very important haplogroup in the IVC region as it is even now though a bit lower, why is it not found in the eastern parts of North India where the post-Harappan IVC people are supposed to have gone? Maybe the high R1a in those regions is masking the true extent of the prehistoric L (in any case, it may have been less, considering these Ls may have been elites; even in South India, it is H that dominates (one of whose branches may indeed have been the predominant Y-DNA hg carried by PD-speaking males) as in the north.)? If some of my musings and all these questions are quite idiotic and as such very cringeworthy, please pardon me. Addressing the likely allegation that I am a person with an anti-Indo-Aryan bias, I just want to say that it is fine with me if the IVC language, Language X and others somehow turn out to be identical to Indo-Aryan or any earlier IE or whatever; it just drastically decreases the thrill quotient of all of it lol. Lost languages and undeciphered scripts are always very thrilling to speculate about, no? If Etruscan is EEF derived, then we have a good starting point for a language family with Tyrsenian. For fun, what shall we call the hypothetical language family that includes Hurrian, Hattic, Northeast Caucasian, Minoan, etc.? Hurro-Aegean? What about Northwest Anatolia ? Maybe Kaskian related ? I wouldn't assume complete linguistic unity for these Neolithic groups. If you look at the spread of agriculture in North America, it was being done by multiple linguistic groups simultaneously, and I don't see why we should assume linguistic unity of people in the Near East either before or after the spread of agriculture. Each population we find seems to be itself a composite of others, and each of those deeper ancestral groups could have one or more languages of their own. That's actually what I love about this sort of research though - that it's starting to reconstruct what the linguistic landscape was before we have written records to go by. So what group of pre steppic people spoke this language? Cant be pure Anatolian-Aegean farmers, right? Maybe mixed ENF-CHG folks? Like Chalcolithic Anatolians? The languages mentioned in the paper plus Elamite, Sumerian and Basque are notable for all being ergative. The macro-family linking them all may have too much time depth to pin down all of the connections, but grammar can be particularly persistent and I think this does point to a link between all of them. Also, while I think that there is no merit whatsoever to Elamo-Dravidian linkage, there is good reason to think that the IVC language (which was almost certainly not Dravidian in my view) might have had something in common with Elamite. Nirjhar, but why, if one is searching for the language spoken from the Anatolian agriculturalists who mixed with European hunter-gatherers, without replaicing them, rather than Hattic didn't Schrijver think to Etruscan? Of course it is unlikely that Etruscan came from Asia Minor as Herodotus said, better Dionysius of Alicarnassus who thought Etruscans having come from North with Villanovians and linked with Rhaetians and perhaps Camuns, but that they have come from Anatolia some thousands of years before it isn't unlikely. Firstly because from a genetic point of view also Barbujani et alii, after having followed the theory of Herodotus, said that the link between Etruscans (and in part Tuscans as I am) and Anatolians there was, but old more than 5000 years, and Alfredo Trombetti thought that Etruscan was intermediate between Indo-European and Caucasian, and that may have happened in Central Europe or in the Alpine zone but also in Northern Anatolia, which had genetic links with Europe in any meaning. The idea that syntax may be more conservative and indicative of earlier connections than lexis is most likely an airy dream that has been propounded by historical linguists who have felt frustrated when hitting a wall in their search for cognate morphemes whose protoforms may be reconstructed according to regular sound changes. Please read the article at https://archaeologynewsnetwork.blogspot.jp/2017/10/the-myth-of-language-history-languages.html if you have not already done so. Unfortunately, you can find the equivalent of this paper for any combination of language families you want. I mean sure, those families MAY be related. But no such connexion can be scientifically demonstrated. There is basically no evidence, and the influences of coincidence and of borrowing cannot be identified. The paper is littered with red flags - statements like "Pre-Greek language is linked somehow with more Eastern languages, some of them still spoken in Northern Caucasus" and "Some Pre-Greek words are actually of Afro-Asiatic origin". This is not how linguists talk. Those statements are totally unsubstantiated and to state them as though there were established facts in the modus operandi of a crackpot. And "in Linguistics, metathesis is seen as a mispronunciation or a misunderstanding of the correct spelling."!? I don't even know whether these writers even understand the most basic elements of the Comparative Method. For instance, they make a big fuss of how, like pre-Greek, Nakh-Dagistanian does not have a voicing distinction, and they point out how voiced consonants in one ND language correspond to voiceless ones in another. But... that's not what that means. The ND language DO have voicing distinctions (well, some of them, at least). The fact that voicing doesn't correspond between different languages doesn't mean that 'the family' doesn't 'have that distinction' - it means that at some point voiceless stops have become voiced stops (or vice versa). In exactly the same way, incidentally, that happened in various branches of IE. This is totally different from what Beekes is saying about Pre-Greek, that the voicing distinction is absent (or at least different) so that IE speakers can borrow the same word from the same language with either voiced or voiceless consonants. This is, to be brief, complete crackpottery. Sorry if I sound a bit agitated by this, it's just that this is the same thing you see again and again, and it's realy frustrating that this sort of thing still gets written. David, you know how pissed off you can get sometimes when there's a genetics paper, or worse, a comment, that commits all the cardinal sins and doesn't seem to understand the fundamentals of what it's meant to be doing? This is that. - the Northwest Caucasian languages are believed to be related to one another. There are no such languages attested in any form until millenia after Minoan. There is no clear reconstructed proto-language for this family - we have no idea what it may have looked like, and attempts to work it out have so far been unsuccesful. We can't even be sure it is all one family (though it looks like it probably is, on the balance of probabilities). - Northwest and Northeast Caucasian do not look related; indeed, in many ways they're opposites. There is a wild theory that they might be related, but this isn't particularly accepted by anybody. Certainly there's no serious reconstruction of what the parent might have looked like. - As I understand it, the 'caucasian' genes people get excited about come from samples from what is now the territory of SOUTH Caucasian. Even people who think Northwest and Northeast Caucasian might be related don't think South Caucasian is related. - Hurrian is attested by a few hundred words. There is a wild theory that it might look something like a distant relative of Northeast Caucasian, but this is very much a minority view. - Minoan is attested by a tiny number of words that may not even be in Minoan, that may or may not be in shorthand, and all in a script that we may or may not be able to even vaguely interpret phonetically, nobody really knows. - Pre-Greek may not exist. If it does exist, many people believe it is Indo-European. Nobody can agree for sure which words are pre-Greek. We don't know if "pre-Greek" was even one language, or one language family, nobody knows. Mwah ... Bit of a load on, isn't it? Especially the tone! Obviously you're not as vacuous as you advertise yourself, but are somehow committed to not-knowing. And in fact you'll probably know a great deal more than I do. But this is no way to dump a paper! This paper is a bit of a long-shot, obviously! Just don't come down from your elevated heights of not-knowing and shoot it down with generalities. When you say you're coming down to reality you're not saying anything substantial at all, as far as I can see. If you are as knowlegdeable as you seem to be, spell it out for us so as we - dumb know-alls - can understand! Jaap: sorry if you didn't like the tone. Please put it down to limitated post lengths and frustration at the 1009th "paper" of similar style. I'm committed to trying not to talk nonsense, sure. There's what we know (Proto-Indo-European was a thing), or can very strongly assert (PIE was spoken on the steppe). There's what we can gainfully speculate about (did pre-PIE come from the Caucasus? Did Etruscan come from the Aegean, or Italy, or Dalmatia? Is Indo-Uralic a thing?). And then there's wild throwing around of totally unsubstantiated (though not insane) ideas (like this paper). Even the last isn't totally without merit as a starting point, but we need to be very clear which thing is which. So yes, when we're doing unsubstantiated brainstorming, I'm pretty "committed" to recognising that this is not the same as "knowing", or even as "seriously hypothesising". Was my summary of what we really know to be the facts 'not saying anything substantial'? Well yes. That's because we don't know any substantial - all we really know in this area is how virtually impossible it would be to know anything at this stage. From a linguistic point of view, we can't say anything meaningful until we have serious, peer-reviewed reconstructions of Proto-Northeast- and Proto-Northwest Caucasian. Then those (which may look very little like the modern languages!) could be compared to the limited Hattic and Hurrian corpora, and to the very little we can glean from Linear A, and to what will hopefully by then be a better understanding of whatever 'pre-Greek' is. And yes, chances are we'll never know much if anything on this question, because the evidence is all long lost. What's important is the angle: is this a way to investigate? To ask that question and then to be answered 'that's crackpottery' without serious arguments is not insufficient. It's worse, methodoligacally, it's beyond the pale! We badly need efforts like these, and what we don't need is ambush-killers like you! I saw that you wrote about that, and that the copper did come from Tuscany we did know, but to hypothesize that there were already 5300 years ago a link between Central Europe and Tuscany due to”Etruscans” is soon to say, also because this migration is presupposed having happened more recently, but it is an hypothesis anyway to investigate. “The ax was discovered in Zug-Riedmatt, one of the many pile-dwelling villages around the Alps that are famous for their prehistoric wooden houses built on stilts on lakeshores and other wetlands”. This seems interesting to me, that this place in Switzerland were inhabited from pile dwellers. I don’t know if you know that many years ago I hypothesized that pile dwellers had come from the Adriatic whilst it was emerging from glaciation and the raising of the level of the sea, and also Etruscans might have come from there more than from the Aegean Sea or Northern Anatolia. I carried also proofs, not mine but coming back to the Thirties of the Ventennio, that Latin presupposes a pile dwelling society (and these witnesses of Latin could be also calques from Etruscan. “The newfound blade was between 5,300 and 5,100 years old and missing its wooden handle. It was about half the weight of Ötzi's blade and shorter, but the same shape. By measuring the traces of lead in the blade, Schaeren and his colleagues could link the copper to the same source in southern Tuscany. Mainstream research normally does not consider the possibility of intense contacts between south and north in the Alps" during this time, Schaeren told Live Science in an email”. Anyway my hypothesis that R-L51 may be migrated from Tiyrrhenian Italy to Southern Germany where we find it in Bell Beakers also through the Alps may not be absurd. Jaap, I don't think I've murdered anybody here. I'm just pointing out that the paper is crackpottery. Unfortunately, it's difficult to have a full critique of a paper in this format - my post was originally twice the length, but I had to prune it drastically to fit under the character limit. - I don't think they understand basic principles, as shown in the nonsense over nonphonemicity vs intra-cladistic variation, and over metathesis. - Rather than comparing proto-forms, they cherry-pick comparison to individual languages, with no discussion of how representative these forms are. - There are no specific suggested sound laws (the core of a genuine relation). - There is no effort to show that correspondences apply to core vocabulary and, most importantly, to grammatical morphemes (i.e. the things that matter in showing a relationship). - Wild speculations are presented as facts with no acknowledgement of how far this is from being scientific. Similarly, the authors are not honest about what is and isn't known regarding reconstructions and hypothetical languages. - The methodology can demonstrate any links between any languages you choose. - The methodology violates fundamental principles of the discipline, and there is no way it would ever survive peer review. - Yes, their 'dragnet' comes back with some stuff in it. But when you see enough dragnets, you realise they ALL come back with stuff in them. It doesn't mean anything. - See how far it goes? It "goes" up to the point where there's no evidence. Other sciences have "proven things", "things with no evidence yet but they might be true", and "things that are known to be false." Historical linguistics just has "things that there's good evidence for" and "things that might be true but there's no evidence yet" - there's virtually nothing that can be proven false definitively. So there being no evidence for something is no better than any other hypothesis - and there's no evidence for this hypothesis. We have reached, for now, the limit of "how far it goes". - is this a way to investigate? No, it's not. It's a terrible way to investigate, and a lot of people have spent the last 200 years explaining why, and I think it screams crackpottery at anyone who knows anything about historical linguistics. Do you disagree? Linguists are basically dependant on what writings Archaeologists can dig up for them to translate with the help of a "Rosetta Stone". Outside this framework most linguists are like fish out of water....That is why we still do not know what Minoans really said or even what the Neolithic Farmers Tablets said....and the ones who are brave enough to tackle this usually undergo a sheetload of criticism....that is my humble opinion. looks like this Caucus connection could bring in the CHG component into Europe during the neolithic or earlier. Could this be causing an overestimation of Yamnaya/Steppe ancestry of the broze age. A substructure of CHG could have been/was present in some Western Europe populations before or contemporaneous with Steppe population expansion? Here we have not the 1009-nth paper on this subject, but the very first. And it asks the question 'Suppose there is a pre-Greek substratum, isn't it likely that non-IE Anatolian is the source? And if so, where in the whole wide world might we find remnants of this idiom?' Big suppose? No, pretty mainstream. Big if? Not altogether that wild, is it? Where it gets wild in your eyes is when they get on with it without a respectable body of data. There is no Proto-Caucasian! There never will be, for there are far too many factors at work here. Totally unrelated languages may sport the same words for certain lithurgical terms (e.g. pooring) for a variety of historical or cultural reasons. Trade, slaves, neolithic packages, technologies, the marriage-market, diplomacy, hostages and/or foster-children, moral codes, archaic(songs, tribal knowledge)-versus-spoken language, the list is endless. All these factors may muddle up genetic as well as linguistic issues. So these guys are cherry-picking! Of course they are! Would you prefer them to pick up turds? I prefer cherries. So I can look at the haul in the dragnet and get my hands dirty. If it were up to you I wouldn't get this chance! Your tone forbids me to take this seriously, and thus you kill off something that might just possibly have flown without your intervention. I have no opinion about these guys' linguistic expertise. Bottom line: no, I don't agree with you! In the hypothetical tract I think we need more room than guys like you allow. And your tone was unscientific and juvenile. Can't think of any pre-Corded Ware Western European populations with CHG. There's CHG in the Balkans that dates to earlier than the first steppe incursions during the Chalcolithic, but CHG by itself won't inflate Yamnaya-related ancestry; only a specific ratio of EHG and CHG will do that. I agree. Some Linguists smother the development of their own Science that is why the average guy like me find Archaeology and Genetics more fascinating with more constructive criticism than what is found among Linguistics these days. Didn't the Spartans have a tradition that entailed the kidnapping of young women to become their brides ?